A FYUL Recovery category recipe is this pistachio and ricotta challa toast with fresh berries. FYUL is designed to meet college student preferences for dishes that meet their ethical and lifestyle needs. Chartwells Higher Education is launching a program called FYUL that uses functional foods such as herbs and spices to help support the lifestyle goals of college students. Developed by the Chartwells culinary team in partnership with McCormick Consumer Testing, FYUL highlights the purposeful benefits of everyday foods and incorporates these high-functioning ingredients into recipes that are to be deployed on dining hall menus at all 280 Chartwells campuses across the country. • Clean Eats, the most simple of the offerings, do not include any preservatives or additives and feature whole unprocessed ingredients. Currently, there are about 150 recipes in the system, Lapp says. Examples include a black bean and sweet potato taco, a salmon poke bowl with black barley and lime crema and an almond milk based “golden milk” incorporating turmeric. 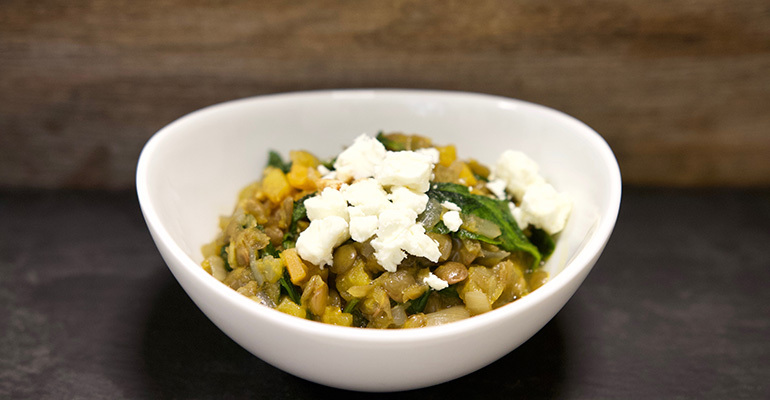 This lentil stew with spinach and sweet potato fits the Earth Friendly category. The dishes are meant to be incorporated into residential and some retail dining outlets. FYUL recipes include not only entrees but also side dishes, desserts and breakfast items. Recipes have specific category tags on the serving station signage to indicate which of the eight FYUL categories it falls under, along with the FYUL logo. FYUL received a soft launch last fall and student reaction has been positive,” Lapp reports.